Chapter 6 of the new 2010 ACI 360 Guide to Design of Slabs on Ground has been released and, as in the past, the guide becomes the primary design and product specification tool for architects, designers, owners and contractors. Making sure that your project meets the new guidelines is critical - especially from a liability standpoint. When issues occur on a concrete floor or pavement, and litigation is the means to settle differences, the ACI 360 document becomes very important, as it will be the standard that legal consul and expert witnesses refer to. What if your project doesn’t meet the new guidelines? How much liability you can afford to assume? In chapter 6 (Joints), you’ll find new criteria for slab-on-ground construction to limit vertical defection of joints in concrete floors. Chapter 6 also includes criteria for defining the acceptable limits on joint deflection plus providing the designer with performance guidelines on specifying load transfer devices in areas of the slab subjected to wheeled traffic, heavy loads or both. The new guidelines offer key language that provides direction for designers to specify methods and materials to the contractor during a construction project. EZdowel is the only plate dowel on the market that has 100% direct contact with the concrete on top and bottom of the dowel. EZdowel has 100% more direct steel surface to concrete contact than any other competitor. 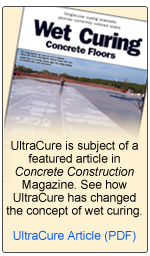 Minimizing vertical deflection is key in obtaining proper load transfer, thus reducing costly maintenance issues and extending the life of the concrete flooring. 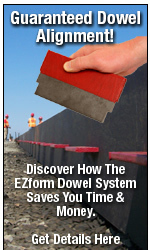 Since the EZdowel is a “direct contact” dowel, there are no plastic pocket formers which remain in the slab. Plastic could possibly crack, or compress under load, which could allow deflection. “Rigid” as defined by the American Association of State Highway and Transportation Offices (AASHTO) is: “The ability to resist deformation when subjected to a load,” Which is exactly what a proper load transfer device is supposed to perform- limiting vertical deflection on both sides of a joint. In ACI 360 (6.2), Walker and Holland recommend deflections less than 10 mils to provide good service life on concrete joints.